At Benner’s Gardens we offer fencing kits that will keep your pets and farm animals in a safe area, no matter their size. 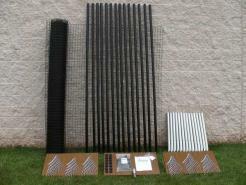 We have fencing kits available in 4’h up to 7.5’ with many options to choose from in terms of length, fencing strength and accessory options. You will be able to find a kit to fit your needs and then customize it with accessories and gate! Choose a basic kit for smaller or less active animals, or select a 7.5’h kits with accessories and chew guard barrier for larger, stronger, active pets. Duke's Domain is our "Top Dog" kit. Great for strong or active pets! 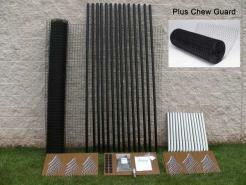 K9 Court has heavy duty fencing and Chew Guard. Ideal for larger pets. Puppy's Paradise is our Standard Kit. Perfect for smaller or younger pets. Rover's Retreat includes Chew Guard for extra protection.